Many thanks to everyone who rode, strode or Church sat this year for the Suffolk Historic Churches Bike Ride. Between us we raised £797.85. Half of this money goes directly to St Mary’s Fabric Fund, half to the Suffolk Historic Churches Trust which can be applied for by any Suffolk church requesting grant aid for repairs and restoration work. Your support is greatly appreciated. 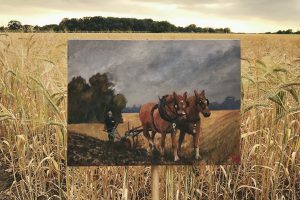 Thank you for all those that supported the raffle for the painting of the Suffolk Punch ploughing near Bulls Wood. This raised £630 which has been put towards the cost of the centenary memorial fire pit, a wonderful addition to the village. Thank you also to all those who gave up their Saturday morning to help with the church yard clear up and to Jasmine for the yummy refreshments. The weather was very kind to us and a beautiful sunny autumn day was enjoyed by all.